In a prior post I discussed Bart Ehrman’s comments on Nazareth archeology made during the Price-Ehrman debate. Here I rebut a number of Ehrman’s errors regarding Nazareth expressed recently on his semi-private weblog. I’ve often wondered why Bart Ehrman expresses any opinion at all on the archeology of Nazareth. After almost a decade (my first book came out in 2008) he obviously has not taken the time to acquaint himself with my work or with the subject. And yet he expresses himself on both counts with ill-founded confidence. His training was “in the study of the Greek manuscript tradition of the New Testament” under Bruce Metzger, among others. There is nothing in Ehrman’s background, training, or personal study that enables him to write intelligently about the archeology of the settlement known as Nazareth in Lower Galilee. As a result, Ehrman predictably doesn’t write intelligently on the subject. He commits errors of the most elementary kind (below)—betraying that he is not familiar even with introductory reference material on Nazareth (including encyclopedia articles and the like). As is well known, I also am not trained in archeology. But I’ve spent twenty years reading, analyzing, collating, and meticulously studying the published evidence (books, articles, catalogs, photos, lists, charts, diagrams, plans, etc.) specifically relating to the Nazareth basin. That should be worth something. And it is. 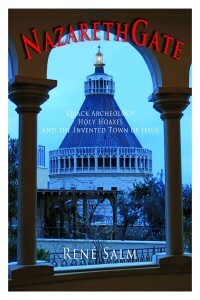 A thousand pages from my pen have been published specifically on Nazareth archeology. That’s more than anyone else—ever (including by the seminary-trained priest, B. Bagatti). As explained on several occasions, in all this work I have carefully avoided doing anything like primary field evaluation. I rely scrupulously on the evaluations of experts in the various archeological subspecialties (oil lamps, pottery, tombs…). I see myself primarily as a diligent secretary, and systematically follow several steps: report collection, compilation/ordering, comparison, and summarization. Conclusions then emerge of themselves, directly out of the summaries. They are so firmly grounded because they are firmly based in the evidence. Unlike the scientific focus of a field archeologist, my Nazareth work has also afforded me more than a little acquaintance with the religious, cultural, political, and economic dynamics affecting this very charged issue. I have developed considerable familiarity with the persons and venues involved, with the varying practices and roles of the Israeli establishment (the IAA) on the one hand and the Church on the other, with the flawed history of Nazareth documentation—as well as with the basic typologies and chronologies of artifacts and structural evidence in a technical sense. This knowledge depends primarily on published reports, but also on private email contacts and even on commissioned work (e.g. photos taken by the IAA). Thus, I have more primary source material at my disposal than available to ordinary scholarship. A good secretary is uniquely positioned to know exactly what goes in and out of the boss’ office. So also, long years of tracking Nazareth archeological reports have given me an intimate acquaintance of sometimes subtle developments on the ground. Indeed, my involvement over the last two decades has not been entirely passive and that of a mere observer: I’ve had a hand in generating/modifying reports myself, such as the Amendment written to the original Nazareth Village Farm report (BAIAS) in 2008. There are scientifically defensible reasons to thoroughly reject the conclusions of well-trained archeologists on Nazareth—including those of Yardenna Alexandre, a professional who is extremely competent in the subfield of Lower Galilean archeology. The problem with Dr. Alexandre’s writings and views is not competence—it’s that they are not free of constraints deriving from the Israeli government (for which she works) and from the tourism industry (see NazarethGate on this). Another well trained archeologist whose work I’ve critiqued is Ken Dark. However, his training and expertise focus on the archeology of Celtic Britain. In contrast to a specialist like Alexandre, Dark is unacquainted with Palestinian typologies and applicable chronologies. As a result, he blithely uses Jerusalem evidence as if it were Galilean and completely misconstrues tomb and ossuary chronology. He also has some strange (and convenient) notions regarding Jewish praxis in late antiquity (e.g., that Jews hewed multiple tombs under recently abandoned dwellings on the Nazareth hillside). I point out these and other flaws in my writings (NazarethGate Chps. 5, 6, and online here). I’ve also engaged with the work of less systematically trained fieldworkers, such as J. Strange and S. Pfann—neither of whom is a fully trained archeologist. The archeological work of these two scholars is, in my opinion, confessionally oriented and not objective. They represent a host of Christian “archeologists” lacking rigorous training—religious scholars who go to the Holy Land and dig there (if at all) primarily in order to demonstrate that the Bible is reliable history. As regards Ehrman: his written opinions on Nazareth (not frequent, but asserted over a number of years) present one error after another. This is not surprising, for he does not even have a basic acquaintance with the archeology of Nazareth or of anywhere else. I would like to note that I don’t care to demonize professor Ehrman. I find him refreshingly not stuck-up. (When’s the last time you saw him wearing a tie?) This suggests a welcome openness to me—though I have no idea whether or not the James A. Gray Distinguished Professor of Religious Studies at the University of North Carolina at Chapel Hill (whew!) is approachable in his office and in the halls of power. Be that as it may, my issue here is not with the person but with the Nazareth evidence. And there, unfortunately, Ehrman professionally steps way out of line—and well out of his comfort zone. I am not a paying member of Bart Ehrman’s restricted blog (“for members only”). However, Neil Godfrey recently made public an extended excerpt of Bart’s post relating to Nazareth. Ehrman’s remarks below are in red, followed by my comments. Thus Ehrman begins some extensive remarks on my work, but he doesn’t realize that I’ve written two large books on the subject. This is inexcusable. How can Ehrman critique me when he is not even aware of what I’ve written? It is astonishing. The book appeared in 2015 and has 518 pages in 14 chapters. Mythicists (such as Salm) have argued that Nazareth cannot have existed because (a) we have no record before the NT of any such place and (b) we have no archaeological evidence for the place where it should have been if it had in fact existed. The Christians who made up the place, some of the Mythicists aver, did so on the basis of their belief of who Jesus was. There is indeed “no archaeological evidence for the place where it should have been.” And that is why the case is closed. The earliest Christians who made up their myths understood that Jesus was a descendant of King David, in fulfillment of the prophecies of Scripture. One of those Scriptures speaks of the messiah as the “branch” of David (Isa. 11:1). The Hebrew word for branch is NZR (ancient Hebrew used consonants but not vowels). Christians who thought Jesus was the NZR invented a place from which he came: NaZaReth. It was a place that never existed. This contains an embarrassing error. Anyone with an elementary knowledge of Hebrew knows that the word for branch at Isa 11:1 is not NZR but NTsR (nun-tsade-resh, BDB 666). On the other hand, NZR (non-zain-resh) means “consecration, crown, Naziriteship” (BDB 634). They are two completely different roots. Now elsewhere Ehrman claims that he “learned Hebrew, so I could read the Old Testament in its original language.” He needs a refresher course. As it happens, the difference between “z” and “ts” plays an important role in relation to Nazareth and its cognates. Even introductory encyclopedia entries on the town raise the remarkable fact, long known and discussed, that the Greek name for the settlement does not linguistically conform to the Semitic name. (See Schaeder’s article, Nazarénos in Kittel, p. 875.) The Greek has the zeta—a voiced sibilant. But the Semitic has the tsade (Nun-tsade-resh)—an unvoiced sibilant. In other words, the Greek name in the Gospels—though arguably related to NaZiR (“nazirite”)—is certainly not linguistically related to “NTsR” (“branch,” also “watch, guard, keep”). It’s application to Nazareth and to Jesus as a “Nazarene” was clearly artificial. This is an important observation regarding the activity of the evangelists. “Nazarene” represents an artificial transliteration change made at a very early stage (the Gospel of Mark) in the Greek gospel tradition. The change was either deliberate (for theological reasons) or was an error. I favor the former possibility: using the “z” effectively directed the attention away from the Semitic natsuraia (root: NTsR) which had offensive gnostic meanings that must be revisited by scholarship. In Mandaic, the natsuraia is the “guardian of mysteries,” the one “skilled in esoteric knowledge,” and the follower of John the Baptist (Drower & Macuch, A Mandaic Dictionary, p. 285). In a nutshell, the Hellenist Christians transformed Jesus the Gnostic into Jesus the Nazarene (blandly defined as “the holy one of God”—Mk 1:24). The evangelist Matthew went a step further than Mark and applied the Greek term (with the “z”) to an invented town he called “Nazareth.” It was only much later—probably at the time of Empress Helena in the early fourth century—that Christians designated a village in Lower Galilee as “Nazareth.” Archeology shows, however, that the village came into existence about 100 CE. The reason I think this is wrong is because archaeologists (contrary to what Mythicists claim) have actually dug at the site where it has traditionally believed that Nazareth was and have shown that it did in fact exist, in the days of Jesus. This is incorrect. If Ehrman cares about evidence he really must read my books! A gross mischaracterization. The material record shows that the Nazareth basin was completely uninhabited from the Assyrian invasion c. 730 BCE (when nearby Megiddo was destroyed) to after the First Jewish Revolt, c. 70 CE. That’s not “in Jesus’ day.” It’s a whole 800 years! Ehrman beats his own multiple strawmen here. No one claims that Nazareth “never existed.” Ugh. but two kilometers away in the valley; [The valley floor is only 250m from the hillside—NazarethGate, Fig. 2.1, replicated at right]. 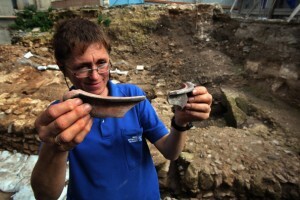 Well, if the site hasn’t been excavated, how could there be “evidence” that it never existed? Gobbledy-gook. The valley floor has indeed not been excavated. The evidence, however, comes not from there but from the hillside, which has been excavated. That evidence is entirely funereal and agricultural. It demonstrates human presence beginning c. 100 CE. The Jews who hewed those tombs (II CE+) did not live in their immediate vicinity (which would be contrary to religious law). They quite obviously lived on the valley floor, immediately at hand, and used the hillside for burial and agricultural purposes. Got it? Anyway, as I said, archaeologists have in fact dug on the hillside where ancient Nazareth has long believed to have stood, and have found important remains – one house, and a farm, and most important, various coins from various periods, including the time of Jesus. Here Ehrman’s lack of acquaintance with my second book is fatal. I devote a long chapter in NazarethGate to the “house” (it is a wine-making installation), a long chapter to the Nazareth Village Farm (the evidence is all Middle Roman+), and a long chapter to the coins from Mary’s Well (all clearly Middle Roman+). The coins have been the object of particular shenanigans. Some years ago Ehrman accepted rank hearsay as evidence regarding these coins (NazarethGate, p. 166). Evidently, he continues to do so. The truth, however, is otherwise. In short: the archaeologists (Alexandre, Berman) claim to see various “Hellenistic” designs on ten coins from the Mary’s Well area. I commissioned the IAA to take professional photographs of these coins for my use. The conclusion: the coins are so pitted and water-worn that not a single line is detectable and the claimed Hellenistic designs are obviously bogus. Furthermore, the coins were discovered in water channels at Mary’s Well that were constructed in Middle Roman times (pace Alexandre herself). Clearly, the coins were not deposited into those channels any earlier. So certainly Nazareth was there, exactly where it was supposed to be. 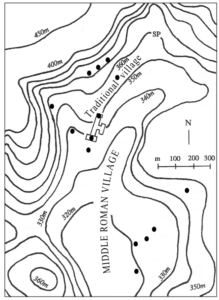 The archaeologists have concluded that the village/hamlet must have had something like fifty houses in about a four-acre area. So the reason the argument on this point by the Mythicists is wrong is that it’s been proven to be wrong. No it hasn’t. What Ehrman has proven is that he simply doesn’t put evidence first. The reason it is silly is this. Hardly. If his name was “Barack of Shangri-La,” and Shangri-La was proven not to exist, then Ehrman would have an analogous case. I find arguing with Mythicists, for the most part, terribly frustrating. Possibly you can see why. Bart’s frustration is predictable: he is handicapped by an all-too-facile illogic and by not attending to the material evidence. By coincidence, my copy of The Myth of Nazareth arrived in the mail just the other day. Although it’s an exhaustive, meticulous survey of the evidence, I was able to read at least a third of it the first night. It seems that Bart Ehrman should be able to take a little time away from writing the 57th iteration of his book to read your two. But those strawmen are so enticing!